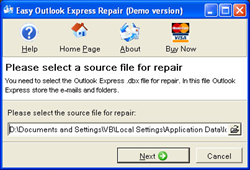 Mail Repair, developer of a broad range of specialized data recovery tools, announces the availability of a considerably reworked and largely improved version of Easy Outlook Express Repair. This compact, yet powerful DBX restore product enables users to restore the contents of damaged OE files on their own, spending a minimum of time and effort. This compact, yet powerful DBX restore product enables users to restore the contents of damaged OE files on their own. The solution is perfectly suitable for non-professional users who want to solve the problem of damaged DBX files without handing their emails to somebody else and without having to pay considerable amounts of money to external services. With this DBX restore tool, users get an opportunity to recover data from damaged Outlook Express files quickly and effortlessly.